Quince is brilliant! I'm going to try that next. I hope you enjoy it, Lynda! I've had a few extra quinces so have been cooking them and adding to other dishes - so fun to discover something new. What a beautiful idea! I had my first experience with quince last year and those puppies are sour! What more natural pairing than cranberries?! Thank you, Brooke! Have you done any cooking with quince since first tasting it? I'd love to make more with quince - I should probably read that chapter in Nigel Slater's Ripe! Yes!! The floral fragrance is wonderful - maybe I'll just cook some to scent the kitchen! My table is the same, cookbooks and clippings everywhere. 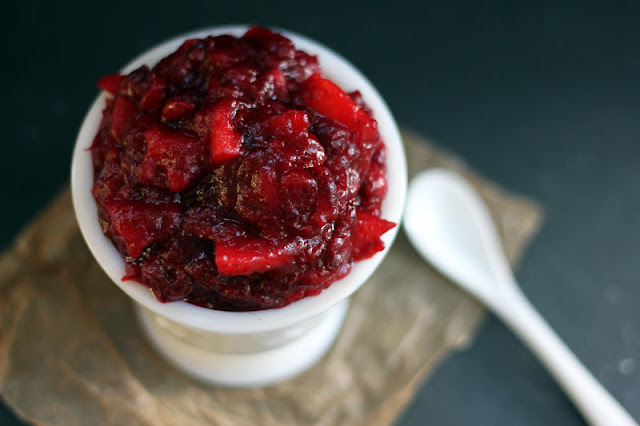 I never thought to add quince to the cranberry sauce. What a lovely idea!! I think the quince would go beautifully. I usually do the same thing every year, cranberry made with fresh orange juice and its really good but this sounds really wonderful and a great change from my usual. Happy Thanksgiving! I also wish it could last longer than one day its my favorite holiday. 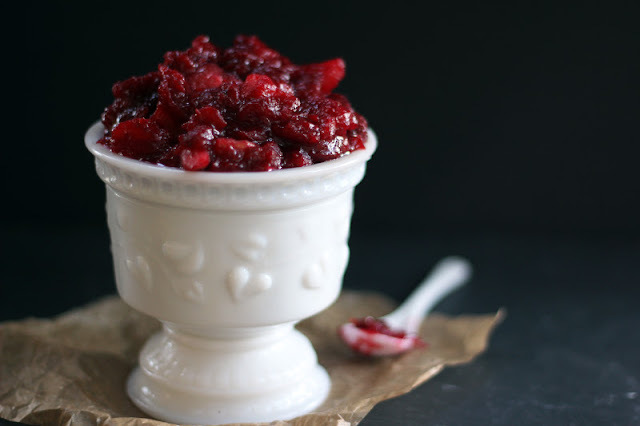 Cranberry sauce with orange juice is delicious - cranberries and orange pair so well together. I hope you're having fun with your menu planning! Thanksgiving is my favorite holiday to cook for, closely followed by Passover - and fortunately that one lasts a week! You did a fantastic job with giving a classic a very yummy twist. Thanks for sharing, it sounds so good. What a cool idea! I really like that you used apple cider in this recipe. I tried cooking with quince once last winter, and I'm anxious to try it again. Thanks, Brianne! 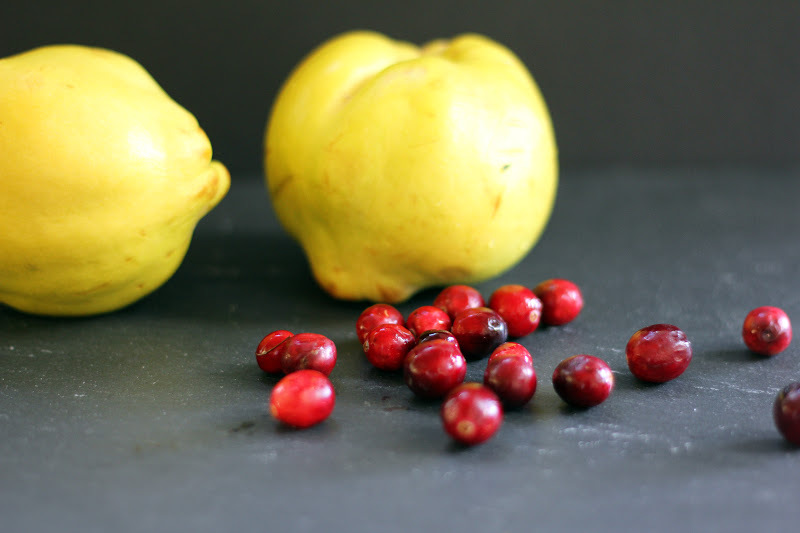 What did you try with quince? I'd like to make more with it, too. I think 8 days of Thanksgiving would be a fantastic idea! I also get overwhelmed with all the recipes out there that I want to try for the holiday. Its so hard to settle on just a few. This cranberry sauce sounds so interesting and different. Another recipe to add to the list! I've heard about quince before but never tried using it in my cooking (or maybe I have never tried tasting it too). I didn't grow up with Thanksgiving culture so everything is sort of new (and my way... :)). I'd love to taste this sauce! I hope you enjoy the sauce if you make it, Nami! And I recommend you give quince a try - it's quite delicious and I love how it transforms with cooking. I'm sure you are creating some delicious Thanksgiving traditions in your family! Thanks for the recipe, Hannah. I have a bowl full of quince sitting on my dining table waiting ever so patiently for me to figure out what to do with them! This is a new fruit for me. Quince, cranberry, and apple sound like a wonderful combination!